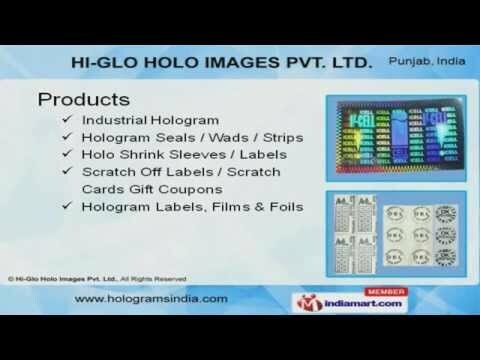 Welcome to Hi Glo Holo Images Private Limited, Manufacturer and Exporter of Holograms and Security Aids. We are an ISO 9001:2000 certified company, established in the year 1995 at Patiala. We are member of HOMAI, FIEO, IIP and IOC and export to Australia, Central America and other countries. Competitive prices, International quality standards, Diligent and efficient workforce are the plus points of our organization. We offer a huge gamut of Hologram Seals, Wads, Strips, Labels, Films and Foils. Our Industrial Holograms are best in the industry amongst others. Hologram Seals, Wads, Strips offered by us are extremely reliable. Our Holo Shrink Sleeves and Labels are appreciated for their excellent designs. We also provide Scratch Off Labels and Scratch Cards Gift Coupons that are a class apart. Along with that we offer Hologram Labels, Films and Foils that are very stylish and elegant.